Timmy and friends Ruffy and Otus from the TV show Timmy Time help your child build their confidence in English and boost their motor and memory skills in Timmy’s Learning New Skills. Safe, ad-free, English language learning fun for children aged six and younger, designed by the British Council, world experts in teaching English trusted by parents worldwide, in partnership with Aardman Animations. DISCOVER up to 60 words and phrases in English, including numbers, colours, shapes, food, animals, classroom objects and toys, to build vocabulary. EARN stickers and videos – fun rewards motivate your child to keep learning! LISTEN to the narrator and practise saying the words aloud. 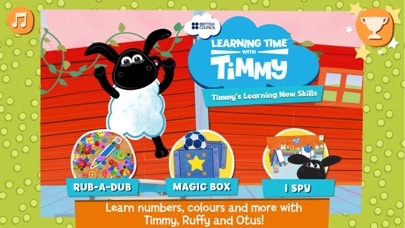 Timmy’s Learning New Skills includes three bite-size and age-appropriate games that are designed by British Council English teaching experts to provide hours of high-quality learning content for your child and challenge them as they progress. •I-Spy – your child will search for hidden objects to learn new vocabulary, identify objects and boost their concentration. As your child progresses, objects get harder to find, requiring serious focus! •Magic Box – your child will be guided by the narrator to organise items by type and colour. The game gets more and more challenging when we introduce multiple boxes, so that your child learns advanced sorting skills and is encouraged to make choices. •Rub-a-Dub – your child will listen to the narrator and swipe away sand, buttons and paint to identify objects hidden beneath. The game starts with single words such as ‘pear’ and ‘pencil’ and builds up to complex phrases such as ‘three green paintbrushes’, so that your child is challenged as they advance. Learning Time with Timmy includes face-to-face courses, three educational apps and an online series available on YouTube and TV to help your child to develop and become a confident learner of English. Your child’s privacy is very important to us. We do not collect any information about your child or your family. The app provides a completely safe learning environment, with no adverts or links to other websites. We track how the app is used, such as which of the games are most popular, in order to make the app more enjoyable for your child. Your child can continue their language learning adventure with Timmy’s First Words in English and Timmy’s Starting to Read. All our apps are designed to be intuitive and have been improved using feedback from teachers, parents and children. Visit our website to see our full range of apps: http://learnenglishkids.britishcouncil.org/en/parents/apps . Get the latest version for an improved experience on iPhone X, XS and iOS 12. Thanks for using Timmy’s Learning New Skills!